When you think of Brazil, your mind instantly conjures up vivid images of colorful carnival costumes, mesmerizing samba, enjoying a perfectly mixed caipirinha on a stunning white sand beach and endless stretches of Amazon rainforest. But Brazil with a coastline extending for more than 4300 miles is increasingly on the mind of adventurous divers. With famous wrecks and healthy reefs stretching from Recife to Serrambi in the Northeast, to pristine rocky dive sites in the South around Bombinhas; the variety and quality of the diving is staggering. DIVELYMPICS 2016, WHO IS THE WINNER? Undoubtedly one of the best diving spots in Brazil. This archipelago in the Northeast of the country has amazing dive conditions with visibility sometimes exceeding 40 meters/130 feet. 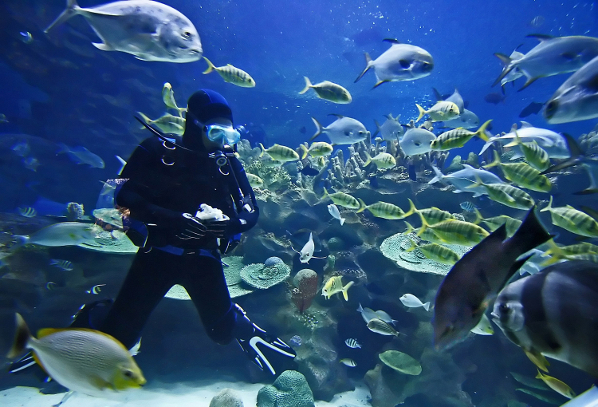 It boasts an incredible array of marine life including more than 200 types of fish. Most notable among them is the healthy population of spinner dolphins that come to Fernando de Noronha to breed. Advanced divers may also be tempted to explore the Corvette V17, an intact battleship that sits at 197 feet/60 meters. Widely hailed as one of the top dive destinations in Southern Brazil. The surrounding area’s name of Cabo Frio, Cold Cape, reveals the need for thick wetsuits, with water temperatures hovering between 50-70ºF/10-25ºC. But a few shivers are worth the trade off – the waters are crystal clear and rich in nutrients. Keep your eyes peeled and camera primed for sea turtles, stingrays, seahorses, octopus and anemones. With plenty of sites suited to new divers, there’s something that will appeal to everyone in Arraial do Cabo. Deep in the heart of Brazil’s Mato Grosso do Sul state lies Bonito, an aquatic playground for adventurous divers and travellers. Warm up by donning snorkelling gear and heading to the Rio da Prata and Rio Sucuri. The water’s so clear and fish so abundant you might as well be floating in an aquarium. The unique conditions of the river result in almost air-like visibility. Its subterranean sources include a limestone base, and calcium carbonate that calcifies impurities in the water. Next, head to Abismo de Anhumas, an underground lake filled with staggering stalactite formations. You’ll need to rappel 235 feet/72 meters down to the bottom of the cave. The dive site has imposed limitations of just eighteen visitors per day, a site not to be missed. While there’s no diving around the city of Rio de Janeiro, there’s plenty in both the state of the same name, and further along the coast. Popular dive destinations in Rio de Janeiro state include Angra Dos Reis, which boasts wrecks and caves. Ilha Grande featuring warmer waters and plenty of tropical fish and Paraty, great for beginners and advanced divers. There are also freshwater diving opportunities inland. Scuba diving in Brazil is available year-round, with January to March bringing slightly warmer water temperatures. Visibility – Depends on location and season but can exceed 30 meters/100 feet. Water Temperature – Brazil is a big country and water temperature varies. However, the average sea temperature for the Southeast of the country is around 25°C/77°F which increases and decreases in winter and summer months. Weather – For the Southeast and Rio the annual minimum temperature is 21°C/70°F. The average annual maximum temperature is 27°C/81 °F. You can enjoy diving in Brazil year-round; with the summer months of December through to February being the most popular. The dive season runs year round in most regions, check locally before booking. Featured Creatures – Manta rays, bottlenose dolphins, sea horses, turtles, whale sharks, lemon sharks, nudibranchs. Witness the wonderful mayhem of one of the world’s wildest parties. While Rio is most famed for the spectacular Carnival processions through its purpose-built downtown Sambódromo, the whole city joins in with samba school parties and fancy dress balls. The main events last three days but Cariocas keep the fun going all week. This spectacularly rich ecosystem in west-central Brazil is home to big cats, reptiles and hundreds of exotic birds. The Pantanal’s vast wetlands have wide-open savannahs, which unlike the Amazon’s dense rainforests, allow easy viewing of their abundant wildlife. The dry season (April-October) is the best time to visit, when animals cluster around the waterholes and the birds are breeding. Set amid rainforest teeming with butterflies, birds and many other animals, these majestic waterfalls in southern Brazil are one of the great wonders of the Americas. The 275 individual falls encompass a vast area protected by two national parks (one in neighbouring Argentina). The highest fall, the Garganta do Diabo (Devil’s Throat) reaches 70m (230ft) and is one and a half times the height of Niagara Falls. Watch the belojogo (beautiful game) in Rio’s world-famous Maracanã Stadium. With fans dancing, singing and pounding drums amid clouds of coloured smoke, the carnival atmosphere on the terraces sometimes overshadows the game itself. Football is a national obsession and matches are passionately noisy affairs. Floating through the rainforest on an Amazonian ferry is one of life’s great travel experiences. The world’s largest rainforest is fed by 10 of the world’s 20 largest rivers, including the Amazon itself, which is the biggest river system on the planet. The usual base for trips is Manaus, but try Santarem for a lesser-known alternative.